Last week, the folks at YouTube Rewind released an epic, five-minute mashup of 2013&apos;s most viral YouTube sensations. Based on Ylvis&apos; hit parody song, "The Fox," this mega-viral masterpiece is loaded to the brim with pop-culture references and features cameos by more than 60 YouTube celebrities. I spoke by phone with Nate Houghteling, a viral video guru and the founder of Portal A, the creative studio that helped to produce "YouTube Rewind: What Does the 2013 Say?" Gabe Grand (GG): What was the inspiration behind your "What Does the 2013 Say?" video? Nate Houghteling (HN): We wanted to create an epic video that captured as much of the YouTube zeitgeist as we could. The first thing we did was to dive into all the big videos from 2013. We had a lot of help from the YouTube Trends team — they keep tabs on what&apos;s big on the site. We worked with them to come up with a framework that encapsulated all of the madness of 2013. GG: What was that framework? NH: The mechanism that we came up with was the "rewind button." It&apos;s a little bit like the moment before you click a link to a YouTube video by email or on social media and you don&apos;t know what&apos;s going to happen. There&apos;s a lot of expectation and excitement. You know that madness is about to be unleashed. GG: What was your role in producing the video? NH: I&apos;m Executive Producer at Portal A. That means I managed the production team, and I was involved in a lot of the writing and concepting [of the video]. Once we had the idea put together, I also helped determine how we used our resources and time to create the most epic video possible. From there, we saw who we could get in terms of talent and found a thousand little references and easter eggs to throw in. GG: How long did it take to produce? NH: From start to finish, it was about 10 weeks. We wanted to be as relevant as possible, so we wanted to make sure that we still incorporated references that came in late in the year. It came together very efficiently and we had a lot of help from Google and YouTube. GG: What&apos;s the one most clever easter egg in the video that people won&apos;t catch on to? NH: A lot of people ask about the goats. Goats had a big year on YouTube. There was obviously "Goats Yelling Like Humans." That goat was inserted into a lot of other videos, especially power ballad-type videos. We had a ton of fun thinking about different ways to incorporate goats in there. There were also a lot of subtle references to Mackelmore&apos;s "Can&apos;t Hold Us" like the plane, which is in the opening of the video. The haircut scene is an homage to when Mackelmore is cutting Ray Dalton&apos;s hair in the "Can&apos;t Hold Us" music video. There are several other references to that video sprinkled in there just because it was such a big inspiration for our own style. GG: Who was the most fun YouTube celebrity to work with? NH: I loved the performance we got from Grace Helbig (dailygrace), who was Katy Perry in the dance scene. She was really expressive and brought a lot of energy and fun to the video. Tyler Oakley&apos;s Lady Gaga was incredibly funny and I think the role fit him perfectly. Our two Mileys were awesome, too: Hannah Hart and Jenna Marbles. GG: Who didn&apos;t you have that you wish you could have worked with? NH: We had a lot of people on our wish list. I would have loved to get Jean Claude Van Damme. We also would&apos;ve really liked to get Ylvis in the video, just because "What Does the Fox Say?" was such a monster hit, but their schedule wouldn&apos;t allow for it. Maybe also Miley Cyrus herself. But overall, we were very happy with the turnout. GG: You filmed in 10 different locations. What was the coolest locale? NH: We sent a team to Brighton in the UK to film PewDiePie at the last minute. We sent a skeleton crew — like a SWAT team — to go out and capture that. We&apos;re incredibly happy that we did because basically every third comment on the video has been, "Where&apos;s PewDiePie? Oh wait, he&apos;s at the end." So it was well worth it. GG: Were you surprised by the overwhelming reaction that your video received? NH: The YouTube Rewind has become sort of a brand that people look forward to year after year. We knew it was going to be big, but it&apos;s definitely exceeded our expectations. We&apos;re extremely happy with how our video has done, in terms of both the volume of people and the feedback it&apos;s getting in the press and in the comments. I think people really recognize the work that went into it and also how much we love YouTube, which I think came across really well in the final product. GG: What new trends did you see on YouTube this year? NH: YouTube is going through an adolescent period right now. It started with a lot of home-grown content and was known for amateur, out-of-left-field stuff. Now, as evidenced by the people we had in the video — like Jimmy Fallon, Jimmy Kimmel, Mackelmore and Sesame Street — more mainstream media partners and entertainers are getting involved in the platform. I think that&apos;s a great development. YouTube will always be home to that kind of weird, unexpected, "only on YouTube" content, but I think there&apos;s a lot of room for growth as well. Professionally produced content is finding a home on the site, which is an inevitable process given the sheer volume of viewers. Entertainment properties are already starting to migrate there. GG: What about the increased brand-ification of YouTube? It&apos;s a natural step that&apos;s in keeping with the maturation of the platform. There&apos;s this behemoth, which is YouTube, that has a whole constellation of stars and a whole universe of its own viewers. Brands will inevitably want to be a part of that in order to reach those users and potential customers. Brands will also be a really good thing. We&apos;ve seen that with brands like Red Bull and GoPro, which are not just creating commercials, but fun, shareable content that people will choose to seek out on their own. There&apos;s a lot of room for brands to explore YouTube, but they have to do it the right way if they&apos;re going to gain any traction. GG: What&apos;s your favorite video that Portal A has produced so far? NH: My favorite project we&apos;ve done so far is a web series that we created a few years ago called White Collar Brawler. It was a serialized show about amateur boxing that we eventually sold as a TV show concept. We built it absolutely from scratch without any branded partners. We just created awesome content and brought it to people. To me, that illustrates the massive power of storytelling on YouTube. 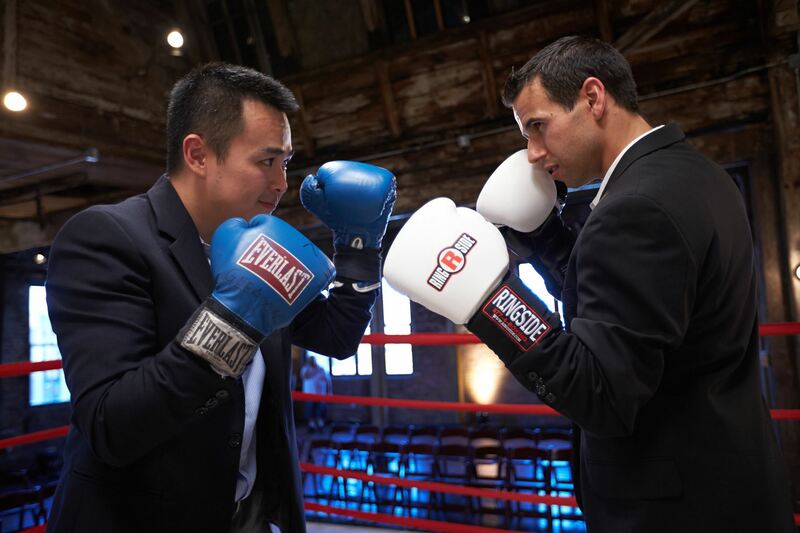 "White Collar Brawlers," now an Esquire Network show, courtesy of the Pittsburgh Post-Gazette. GG: Before you founded Portal A, you spent time doing videos in Asia. Tell us about your time in the Far East. Right out of college, my friend (and currently one of my business partners) Kai Hasson and I created this web series called "Huge in Asia." We traveled throughout Southeast Asia on motorcycles. We were in Hanoi, Vietnam. I also went to China, Mongolia and Japan. It was sort of an excuse for us to travel, but it also allowed us to create a ton of content. I think we produced something like 50 short-form videos that we posted on our site, hugeinasia.com. Houghteling and Hasson in Vietnam in 2007. Photo by Kai Hasson, courtesy of SFGate. GG: What was it like to film in Asia? NH: It was surprisingly easy. Every time we took out our cameras, we would get mobbed by people wanting to be in the video or just see the camera in action. I think we only got shut down a couple of times. That was five or six years ago; I imagine if you went back there now, it would be a lot more difficult. GG: What was the craziest thing that happened to you in Asia? NH: We were motorcycling in Cambodia and one of the bungee cords holding my stuff broke. My backpack — which had all of our tapes from the trip and the computer that we used to edit them — fell off. A truck driver headed in the opposite direction picked it up and drove to the opposite side of the country. We put an ad out on Cambodian national TV asking for it back. The guy drove all the way back and we had a standoff negotiation to buy it back from him. It was like the plot of the lamest action movie ever. GG: What do you see as the future of YouTube? I really feel like the platform has only scratched the surface of what it&apos;s capable of. There&apos;s a lot more potential for brands and professional creators to get involved. Also, there&apos;s room for more collaborations like Rewind 2013. We can&apos;t even really imagine what the platform is going to become in the coming years, and we&apos;re just really excited to be a part of it.